Summer months bring sunshine and long-awaited warm days, with cool drinks and treats families and guests love! 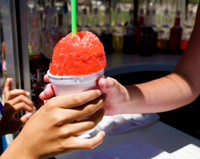 Snow cones, popsicles, juices, drink mixes and sports drinks in every shape and color are great summer refreshment, but the dreaded red stain is no treat for you or your carpet! This month we'll welcome summer with a tip to help you keep your cool when drips hit the rug! Important Home Safety: Be sure to keep children and pets away from the area before you use this method, and never leave your iron unattended. Your iron should never directly touch your carpeting (always apply using the method above, with a damp towel in between iron and carpet). Will this work on an old stain? Pro advice: Working with the stain as soon as possible following the spill will produce the best results - however, give us a call for stain removal. We've been able to successfully remove red stains that have been set in carpet for quite some time, and we'd be happy to answer your questions!